This is a prototype for a new book we want to write for kids. This is the First Draft and we want kids to help write it. If they do, their names and comments will appear in the book. The deadline for submissions is March 2001. Right now, we would love to hear your questions. What questions do you have about acid mine drainage, colors in the water, critters in the water, or any other water quality questions? Our addresses are on the cover page. Please write or e-mail nrobbins@usgs.gov with your comments or questions. My sister and I wrote a science book for kids in 1992. (It is now out of print by the federal government and only available from Colorado School of Mines.) It is called "What's Under Your Feet?" We talked to many scientist while we were writing the book. One fascinating finding was that most scientist find their vocation (what they would like to do when they grow-up) by age 8 or 9. This means that, when they were children, they were making observations about their environment. These observations were so powerful that they formed the basis for understanding how the world works. Now, everyone is not going to become a scientist. But everyone is going to enter the job market. It is my opinion that environmental clean up is going to provide many jobs in the future. I think that if we get the kids out and looking and getting dirty now, they will have a body of observational knowledge needed to compete in that future job market. The kinds of experiments that are laid out here are some of the very things that scientist do when they are trying to understand the natural environment and to help clean up problems left from past activities. The observations that kids will be making will also be helping present day scientists. These are our thoughts on why we put these experiments together. We are outdoor people, so we have written this for other outdoor lovers. Some of the experiments are also indoor activities. In the next section is a general description of some goals and objectives we hope to accomplish with these experiments. As you try them and invent new ones at home and at school, please keep these goals and objectives in mind, but also keep fun in mind. You can use this page by scrolling to the areas that interest you the most, you can click on the links provided in the Table of Contents, and for even more information you can search the web using the internal web browser. If you would like the complete 'Hands-on Experiments to test for Acid Mine Drainage' for your computer, simply send an e-mail request to Timothy Craddock (e-mail address is on the first page). The document is available in 'Microsoft Word or Adobe Acrobat formats', please specify which format you prefer in your e-mail request. The document will be sent to you as an attachment by return e-mail. You can also click on the link below to download the Adobe version. Feel free to send us your comments and/or suggestions regarding this site, or questions about any of the information contained within. Being "scientific" involves being curious, asking how things happen, and learning how to find the answers. Curiosity is natural to children, but they need help understanding how to make sense of what they see. All we need is a willingness to observe and learn with them, and, above all, to make an effort and take the time to nurture their natural curiosity. Trying to make sense of our observations. Science fiction writer Isaac Asimov describes science as "a way of thinking, a way to look at the world." Science also involves trial and error - trying, failing, and trying again. Science does not provide all the answers. It requires us to be skeptical so that our scientific "conclusions" can be modified or changed altogether as we make new discoveries. Fossils are bones that animals are through wearing. Gravity is stronger on the earth than on the moon because here on earth we have a bigger mess. Children's experiences help them form their ideas, and these often don't match current scientific interpretations. We need to allow our children to ask questions and make mistakes without feeling "stupid." We can help our children look at things in new ways. For instance, in regard to the blizzard, we could ask; "Have you ever seen it snow sideways? What do you think causes it to move sideways sometimes?" What engages very young children? Things they can see, touch, manipulate, modify; situations that allow them to figure out what happens - in short, events and puzzles that they can investigate, which is the very stuff of science. The goals and objectives of "Hands-on Experiments to test for Acid Mine Drainage" are to help us all become more familiar with one of our environmental pollution problems, "Acid Mine Drainage." However, its ultimate goal is to encourage us to get outside, develop a better understanding about our environment through observation and experimentation, and help us become aware of how human activities can change the nature of our environment. The experiments in this site should always be done with the proper supervision from a teacher or parent. Always use caution and the proper protective equipment (Recommendations: rubber boots, gloves, safety glasses) when you are in or around a stream. Additional safety tips are listed below. Always make sure you have permission before entering private property. "Do not go stream collecting without an adult!" Safety Tips: Always use the buddy system, have an adult check the stream flow and the stream bottom for sharp objects, and when wading in a stream, always wear shoes with rubber soles and good traction. Do not enter the stream if you cannot see the bottom, or do not enter after a hard rain. Wait for several days of dry weather before conducting any outside experiment in or around a stream. Do not go stream collecting without a responsible adult! The pH of a substance is a measurement (color change or number change) of how much acid or base a substance may contain. Many acids and bases are important to the internal chemical reactions that take place in living things. Most living things attempt to keep themselves at equilibrium (neutral), but this is sometimes very difficult due to the pH of the surrounding environment. As you can see from the picture above, the pH scale (the measure of acids and bases) ranges from 0 to 14, with 7 being the middle or neutral point. A substance with a pH of less than 7 is acidic and if it greater than 7 it is basic, also called alkaline. Each time there is a change in pH of one unit, it is the same as multiplying ten times (increase or decrease) the strength of the acid or base. Litmus paper is one way to measure the strength of an acid or base substance. Other ways include, electronic pH meters and test kits that will measure acids and bases by comparing color scales. Check the web site's below for more information. Pull off the cabbage leaves. Press them down hard on the white card until the card turns purple (6th grader Peter Cable discovered that the purple in the leaves works the best). When you have turned the whole card purple, put a drop of each test substance on the card. More things to do (You'll need a blender and adult supervision). Blend the cabbage chunks into a blender until liquid. Strain the contents of the blended cabbage with the strainer. Mix a drop of this liquid with the substance being tested. Hint: Lemon juice and vinegar are acids and should turn the paper pink (lower pH). Baking soda is a base and should turn the paper green (higher pH). If there are no color changes with your test liquids, this means they are neutral. What is acid and how do you know it? Robert Angus Smith, an English chemist, was the first to use the phrase "acid rain" in 1852. He noticed that the bricks in the buildings were falling apart, and through scientific experimentation, later found that there was a connection between London’s polluted skies and the pH of its rainfall. Most scientist today agree that normal rainfall is slightly acidic with a pH of 5.6. The rain naturally reacts with carbon dioxide in the atmosphere to form a weak carbonic acid. Therefore, scientists define acid rain as any wet precipitation (rain, sleet, and snow) with a pH of less than 5.6. The rain becomes more acidic when it reacts with other gases in the atmosphere such as sulfur dioxide and nitrogen oxides. These other gases are naturally present in the atmosphere in small amounts; Industrial activities have increased their amounts. Get a cup of water out of your local creek and pour it into a bowl. Wash and dry the measuring cup. Test the pH of the water with litmus paper (acids turn the paper pink). Measure out one cup of baking soda. If the water is acid (pH less than 7), slowly stir baking soda into the bowl. Repeat with a variety of acids (lemon juice, cola, and coffee) and a variety of bases (milk, milk of magnesia, and chalk). How much baking soda was needed to neutralize your creek water, coke, lemon juice etc.? What happened when you combined two different acids? Which substance had the highest pH (was the most basic)? What are your conclusions? "Write down what think." If your creek water is clear – Is it clean? Every creek has a different chemistry; Some are polluted others are not. One good way to learn about your creeks chemistry is to study the aquatic life (Macroinvertebrate) in the creek. Biologist and others have collected these organisms from many different places and many different types of creeks. By studying the Macroinvertebrate in the creeks, you can learn something about the chemistry of the water and the health of the creek. Test the pH of the water with litmus paper. "Write it down." Find a stretch of your creek that has a riffle. A riffle is a shallow rapid where water flows swiftly over small rocks (cobblestones). Stretch a net downstream from the riffle. Collect the aquatic organisms caught in the net and place them in a jar. Lay out the aquatic organisms and compare them to the pictures found in this document or other sources. How many aquatic organisms came off the cobblestones? What kind of aquatic organisms were there? What other things were collected in the net? What information can you interpret from the types of aquatic organisms? What are your conclusions? "Write down what you think." The aquatic organisms above are generally "pollution intolerant," which means they cannot live in streams that are polluted, even in small amounts. Their presence in large numbers is usually an indication of good water quality. The aquatic organisms above are "pollution sensitive," which means they can tolerate small amounts of pollutants. Their presence generally indicates moderately good water quality conditions. The aquatic organisms above are generally "pollution tolerant," which means they can live in streams that have high amounts of pollutants. Their presence in large numbers is usually an indication of poor water quality. Note: The Macroinvertebrate pictured above are not to scale, meaning they are not the actual size as they will be if you find them in your creek. They are also not to scale in relation to the size differences between each organism. 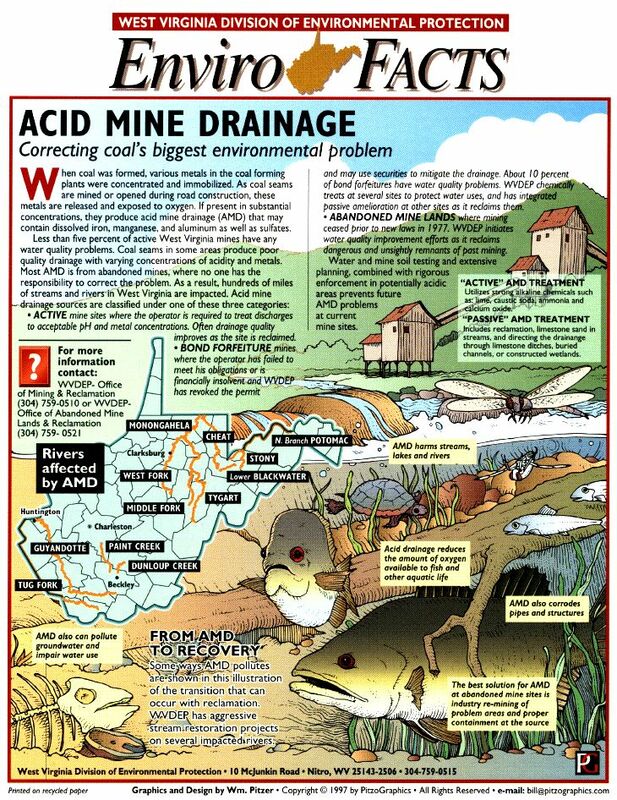 Why does acid mine drainage form? In many areas, acid drainage forms naturally when certain minerals come into contact with water, air and bacteria. This contact and the chemical reactions that take place are part of the weathering process. The weathering of the rocks and minerals in the creek slowly releases the acids, salts, metals and sulfates into creeks, rivers, lakes and wetlands. Weathering is a natural process, but many times human activities interfere and can increase the amounts. When too much of these acids and minerals enter creeks, they become polluted and can no longer support animals. Collect solid materials that are found where you live. Add tap water to bottles. Measure the pH with litmus paper. Add one type of solid material to each of the water bottles. You may want to crush the solid materials into small pieces to get better results. Measure the pH over time and write down what you see. What materials lowered the pH of the water? What materials raised the pH of the water? How long did it take for acid to form? What materials in your area do you think can cause acid mine drainage? How could you prevent acid mine drainage from forming? What types of plants like acid water? There are very few plants that prefer acid conditions in creeks. However, some plants such as cattails can help to change the chemistry of the water by the uptake of pollutants and trapping of materials with their root systems. (For more examples of acid loving plants check the web site below.) These plants work in cooperation with bacteria in the soil to help improve the condition of the water. Today scientists are testing many of these plants to see how they are able to do this. By learning more, scientist are able to create new environments, such as wetlands, to help improve conditions in acid streams. Caution: Some plants have spines or sticky substances to annoy animals. Collect, Draw, or take photos of some of the plants growing along side your creek. If you collect plants, only take one. If you find only one plant by your creek, do not collect it. We would prefer that you draw or take pictures of the plants instead. Take any plants that you collect and press them in a phone book between sheets of newspaper. Identify and make a list of these plants. Dig out one or two of the plants to the root, or find their seeds to see if you can get them to grow somewhere else (do not take any plants without permission). Take a field trip to a wetland area. What types of plants grow along the creek? What kind and color of soil did they grow in (hard, soft, squishy, wet, orange, black, or gray)? What equipment did you need to keep the plants alive? What information did the plants give you? Who is very small and living in your creek? Many plants and animals may not like acid conditions, but certain types of bacteria and algae do. These small one celled life forms collectively known as microorganisms, can be very colorful. The colors are a result of the many different types of chemical processes, of which these life forms are capable. For example, Iron oxidizing bacteria are able to "remove" dissolved iron in the water and form minerals that look like rust. Many types of algae and bacteria use energy from sunlight to produce food, similar to larger plants, in a process called photosynthesis. These processes also create changes in the chemistry of the water. The many different types of bacteria and algae produce brilliant colors such as yellow, red, green, brown and even purple. With an eyedropper, collect in baby food jars the different red, yellow, orange, or brown flocculates (flakes found in the water, on the rocks or on the bottom sediments) in the water. Try filling some jars all the way to the top, and leave an air space in others. Test each jar with litmus paper to check its pH and write down the results. Put the jars on a windowsill. (Put some jars on a south facing windowsill to get direct sunlight. Put other jars on a north facing windowsill so they do not get sunlight). Certain algae will probably develop in the jars receiving the sunlight, and certain bacteria will develop in the jars that do not receive sunlight. Observe over two or more weeks and take the pH of the water regularly. Take notes of what you see, including the date and time of your observations. Observe a water sample every other day with a microscope (if possible). Did swimming protozoan hatch out? Did any of the iron bacteria colonize (coat) the jar? Did any of the iron bacteria form a reddish, oily looking film at the surface between the air and the water? Did any of the iron bacteria form a brown ring at the top of the water? Did you collect acid loving iron oxidizing bacteria or neutral iron bacteria? How can you tell the differences? What is in your creek water? A creek can carry an amazing amount of chemicals. (One reason is that any activity on the land that surrounds the creek can usually affect the creek.) Some of these chemicals are so abundant that they mask "or hide" what is actually going on in the creek. For example, an abundant amount of minerals, metals, and sulfates may increase the pH of the creek, but when these substances drop out of the water, such as when the water flows over rocks or through wetlands, the chemistry of the creek changes and the pH may actually decrease. Baby food jars, pill jars, etc. What to do (Write down your results each time you check the pH). Fill a small jar or pill bottle to the top with water from your creek. Test the waters pH with litmus paper. Pour in one capful of peroxide. Let the red flocculates settle. Test the water again for its pH. Repeat the experiment with water placed in a refrigerator for one hour. Repeat the experiment with water left in a warm stove for one hour. Repeat the experiment with baking soda. What happened when you put hydrogen peroxide in the water? What about baking soda? What happened to the pH? Which reaction (refrigerator or warm stove) occurred faster? What kind of chemical reaction did you perform? Does heat or cold speed up a reaction? How many colors does Iron (Fe) have? Iron is common element of many creeks, especially in the Appalachian region. Iron (Fe) has many different forms and many different colors. Each color tells a different story about the chemistry of the creek. Iron that is naturally found in the creek normally does not cause problems (it is part of the soil and the sediments), but metals can be increased by human activities to a point where they may become harmful to life in a creek. With iron, red is oxidized and black is reduced. Fill jars with red, yellow, or orange flocculates (flakes that occur in the water, on rocks or on the bottom sediments) and water from a creek. These can be found in many creek, but are especially common in creeks affected by acid mine drainage. Dig with a shovel in different places in and along the creek bed, until you find the color change from red to black. Add some black sediment to some of the jars (and make sure water is to the top to keep out oxygen). Label the jars with the dates of collection. Put covered jars on a north facing windowsill and observe them over several weeks. Make observations as to what happened to the colors over several weeks. At the end of the experiment, uncover the jars and smell them. "Write down what you smell." Which of these colors are from iron? Which iron was oxidized and which was reduced? What is the black stuff on the rocks? Finding the minerals that coat the rocks in a creek is a very old profession. The prospectors of years ago used to scrape off the coatings from the rocks in a creek and send them to a laboratory for analysis. These prospectors were usually looking for gold and silver, but many times they found a wide variety of minerals and metals. The coatings and colors on the rocks can usually tell you about the most abundant minerals in a creek. Many times, the color will be caused by the darkest mineral in a creek. Manganese is almost always the darkest color mineral in the creek. These materials can be such things as cans, bottles, tile, styrofoam, paper, plastic bag etc. This experiment requires that your creek have black coated cobblestones. Fill a large jar with creek water; Drop a microscope slide into the jar. Examine the slide at least once a week (should examine it more often). Write down what you see and any changes that occur over time. Write down what day you started the experiment. Examine the items dangling in the creek at least once a week. Write down what you see and any changes that occur. After about six weeks end the experiment. Write down the ending date, along with any final observations. What materials became coated with manganese? What did you see on the microscope slides? Why do you think manganese sticks to many things? Which materials do you think manganese oxidizing bacteria like best? Is the groundwater acid also? The surface water, mainly from rain, runs off over the ground and fills creeks, rivers, lakes and wetlands. A small amount of the surface water does not run off, but instead seeps underground. This underground water is called "groundwater." Groundwater fills the spaces that are found in the soil and rocks and eventually flows downhill, just like creeks. The place that the groundwater is first observed as you dig down from the surface into the rocks and soil below is known as the water table. If you live in an area where your creek is acid, most likely the groundwater will also be acid. 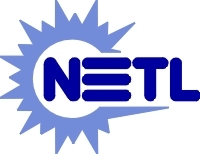 Short length of PVC, steel, or aluminum pipe. Test your creek pH with litmus paper. Move away from the stream in a line (transect) and push a pipe down into the sediment, or dig a hole with a shovel. Collect the water and test the pH with litmus paper. Test another distance away from your creek. How far down did you have to dig to find groundwater as you moved away from the creek? Was the underground water the same chemistry as the creek? Would acids leak into the groundwater from the creek? Or from other underground sources? What is the white stuff in the creek? Both natural processes and pollution can cause foam (white soapy looking stuff) on a creek. It is usually caused by a combination of several different pathways. A simple definition of foam is "A gas (usually oxygen) mixed in a liquid containing some type of impurity." The foam is produced when air bubbles created by water flowing over rocks and over objects, combine or mix with the impurity. Sometimes foams are natural. White colors can tell you when the element aluminum is present, or when sulfur producing bacteria are present. The foam may also be the result of human activities in or around the creek. How can you tell if an impurity is present in the environment? See if your creek has white foam. Collect the white flocculates (flakes that occur in the water, on rocks or on the bottom sediments) in a baby food jar with an eyedropper. Smell the mud under the white flocculate. What do you smell? A sulfur smell can indicate the presence of sulfur reducing bacteria. Look at the flocculates under a microscope. Observe the changes over time. What types of substances are in your creek? How can you find out what is in your creek? How can acid mine drainage can be fixed? Acid mine drainage sometimes forms when certain minerals in the soil and rocks around mines are exposed to weathering processes during mining. These exposed minerals release their contents into creeks causing them to become acidic (lower the pH). Acid mine drainage effects many thousands of miles of creeks throughout the US and around the world. This does damage to the plants and other aquatic life that live in the creek, and makes to water useless or harmful for others who depend on it for recreation or drinking water. Today, many industries use very expensive chemicals and other methods to treat these contaminated waters. However, there are also less expensive methods known as "passive treatments" that can help clean some creeks. You will need enough bottles, and large enough, for each object you plan to test. Find an acid stream by using litmus paper to measure the pH. Collect the water in bottles. Add one natural material to each bottle. Measure the initial pH. Label each bottle and write down its pH. Every few days for about two weeks, measure the pH to see what happens in each bottle. Write down the results. What materials decreased the pH of the water? What materials increased the pH of the water? What materials caused solids to form at the bottom of the bottles? What colors were the solids? Did one of your experiments change acidic water to neutral? What natural materials do you think can be used to treat acid mine drainage? Can you create a treatment system using these natural materials? As mentioned in the previous experiment, there are many expensive ways to treat acid mine drainage, but there are also less expensive more passive treatment methods. These passive treatments may involve the use of constructed or natural wetlands. In a wetland the combination of the plants, the holding capacity (how long the water will stay in the wetland), the soils, and the bacteria are responsible for the treatment of acid mine drainage. Many times these areas have a "rotten egg smell" which is caused when hydrogen sulfide gas is released through biological reactions that take place in the wetland. This is one way to tell if the wetland is doing the job of helping to treat the acid mine drainage. Plastic collection boxes should be large enough for one small shovel full of mud. Bottles should be large enough for at least a tablespoon full of mud and a half of a tablespoon of yeast. Collect acid mine drainage in 9 bottles. Collect mud that smells like rotten eggs from a wetland. Add mud to 6 of the bottles and yeast to 3 of the bottles. Measure the pH in the bottles over time; label each bottle and write down its pH. Watch for different colors to form. Smell each bottle and write down what you smell (rotten eggs, a yeast smell, or something else). What happened in the bottles having no yeast? What happened in the bottles having yeast? Which bottles really smelled like rotten eggs? Which bottles had bacterial activity? How did the bacteria affect the smell of the water? What color was associated with the strong smell? What else did you smell? What might affect the ability of the bacteria to treat the water? Why would people use compost in constructed wetlands? Your experiments must be done many times to guarantee that what you observe is accurate, or to obtain an average result. This process of repeating the same experiment many times is called "repeated trials". Experiments can be more or less complex depending on how they are set up. As you do experiments, record all numerical measurements made. Data can be amounts of chemicals used, how long something is, the time something took, etc. Measurements are an important part of any experimental science project. Observations can be written descriptions of what you noticed during an experiment or problems encountered. You should be looking for differences between your control group and your experimental group(s). If you did not observe any differences between the control and experimental groups then the variable you changed may not affect your experiment. If you did not observe a consistent, reproducible trend in your experimental runs, there may be experimental errors affecting your results, or something affecting the results you may not have thought about. If you suspect experimental errors, the first thing to check is how you are making your measurements. Is the measurement method questionable or unreliable? Maybe you are reading a scale incorrectly, or maybe the measuring instrument is not working. If measurements do not seem to be a problem, check to make sure you are following the rest of your procedure carefully from one run to the next. If you determine that experimental errors are influencing your results, carefully rethink the design of your experiments. Review each step of the procedure to find sources of potential errors. If possible, have a teacher review the procedure with you. Sometimes the designer of an experiment can miss something obvious. Keep careful notes of everything you do and everything that happens. Observations are valuable when drawing conclusions and useful for locating experimental errors. Please send a letter or e-mail and include your name, address, city, state, and zip code. Describe your experiences and tell us what you have discovered. The names, addresses, and e-mail addresses of the authors and contributors are located on the first page.